The atomic number represents the identity of the element and reveals the number of protons, whereas the atomic mass reveals the number of protons and neutrons. The atom is the fundamental unit of an element and it’s composed of the 3 subatomic particles. Remember that the basic functional unit in Chemistry is the atom itself. Now, if we want to go deeper into the atom, remember it's composed of three subatomic particles. We're going to say in the center of our atom, the very center of our atom is what we have, that's called the nucleus. If we take a look at this illustration on the right—that right there what I circled is the nucleus. We're going to say inside the nucleus, we have two out of the three subatomic particles. We have our protons and our neutrons. We're going to say spinning around it, we find the third subatomic particles, so we have the small green negatively charge balls, subatomic particles flying around our nucleus. These are the electrons. We're going to say that the protons are positively charge. We're going to say that the electrons which are spinning around their nucleus are negatively charge and then we're going to say that the neutrons are non charge subatomic particles. They're neutral, they don't have a charge. Inside the nucleus we have protons which are positive and neutrons which are neutral. The nucleus overall has a positive charge and then the electrons are spinning around it, the electrons are negatively charged. Now, what we're going to say here is we're dealing with two types of information on any given element. We're going to say we have the atomic number and we're going to have the atomic mass, oftentimes called the mass number. We're going to say that the atomic number uses the variable Z and it equals the number of protons. So, the atomic number tells us the number of protons and also we determine the identity of an element. If you know the number of protons, then you know the element we're talking about, because each element has a specific number of protons. The atomic number kind of, is like the fingerprint for that element. For example, if you look at periodic table at carbon, you'll see that carbon has associated with it, the number six. That six tells us that carbon has six protons. Carbon is the only element on the periodic table with six protons. Again, remember the atomic number, not only tells us the number of protons, but from that the identity of the element. Now, we also have the atomic mass, also called the mass number at times. We're going to say it uses the variable A or we're going to say, 'This equals the number of protons and neutrons in an element.' So basically it gives us everything inside of the nucleus. Because remember the nucleus also has protons and neutrons. Now, if we bring all of this together, we're going to say our element is, we usually use the variable X to represent our element, then we're going to have the atomic mass is A and then right below it is our atomic number. We usually see this kind of notation in class and on your exams. The number of protons gives the identity of an element. Ions arise when there is an unequal number of protons and electrons. Example #1: Identify the unknown element. Which statement concerning the structure of the atom is correct? A. Protons and neutrons have most of the mass and occupy most of the volume of the atom. B. Electrons have most of the mass but occupy most of the volume C. Electrons have most of the mass but occupy very little of the volume of the atom D. Protons and neutrons have most of the mass but occupy very little of the volume of the atom. How many electrons are necessary to produce a charge of - 1.0 C? What is the mass of this many electrons? Which statements about subatomic particles are true? a. If an atom has an equal number of protons and electrons, it will be charge-neutral. b. Electrons are attracted to protons. c. Electrons are much lighter than neutrons. d. Protons have twice the mass of neutrons. How many electrons would it take to equal the mass of a proton? A helium nucleus has two protons and two neutrons. How many electrons would it take to equal the mass of a helium nucleus? Which statement concerning the structure of the atom is correct? (A) Protons and neutrons have most of the mass and occupy most of the volume of the atom. (B) Electrons have most of the mass and occupy most of the volume of the atom. (C) Electrons have most of the mass but occupy very little of the volume of the atom. (D) Protons and neutrons have most of the mass but occupy very little of the volume of the atom. In which pair are the two species both isoelectric and isotopic? A hydrogen-3 cation has... A. No electrons. B. The same number of protons and neutrons. C. Three protons. D. Two electrons. E. One neutron. What happens when a bromine atom becomes a bromide ion? a) A positive ion is formed. b) The bromine nucleus acquires a negative charge. c) The bromide ion is larger than the bromine atom. d) The atomic number of bromine is decreased by one. Which of the following statements is/are TRUE about subatomic particles? a) An anion has the same number of protons and electrons. b) Neutrons have the same mass as electrons. c) Protons and electrons have opposite, but equal in magnitude, charges. d) Neutrons and electrons are found in the nucleus. Complete the following table by filling in the missing information for each row. Predictable charges of some common ions. Notice that the red stepped line that divides metals from nonmetals also separates cations from anions. Hydrogen forms both 1+ and 1- ions.The most common ions for silver, zinc, and scandium are Ag+, Zn2+, and Sc3+. Which of these ions have the same number of electrons as a noble-gas element? Give names and symbols for the following elements.An element with 23 electrons. Consider an atom of 10B.What is the symbol of the atom obtained by adding one proton to 10B? Consider an atom of 10B.What is the symbol of the atom obtained by adding one neutron to 10B? Fill in the gaps in the following table: Symbol Co3+ Protons 34 76 80 Neutrons 46 116 120 Electrons 36 78 Mass number 59 Net charge 2+ Complete the first row of the table. Identify the element represented by each of the following symbols and give the number of protons and neutrons in each.Identify the element 3374 X. Identify the element represented by each of the following symbols and give the number of protons and neutrons in each.Identify the element 53127 X. Identify the element represented by each of the following symbols and give the number of protons and neutrons in each.Identify the element 63152 X. Identify the element represented by each of the following symbols and give the number of protons and neutrons in each.Identify the element 83209 X. Identify the element represented by each of the following symbols and give the number of protons and neutrons in each.Give the number of protons and neutrons in 3374 X. Identify the element represented by each of the following symbols and give the number of protons and neutrons in each.Give the number of protons and neutrons in 53127 X. Identify the element represented by each of the following symbols and give the number of protons and neutrons in each.Give the number of protons and neutrons in 63152 X. Identify the element represented by each of the following symbols and give the number of protons and neutrons in each.Give the number of protons and neutrons in 83209 X. Which of the following drawings represents a neutral Na atom? Which of the following drawings represents an Na atom? Give names and symbols for the following elements.An element with atomic number 6. Give names and symbols for the following elements.An element with 18 protons in its nucleus. Fill in the blanks to complete the table. Symbol Z A #p #e- #n Charge Si 14 ____ ____ 14 14 ____ S2- ____ 32 ____ ____ ____ 2- Cu2+ ____ ____ ____ ____ 34 2+ ____ 15 ____ ____ 15 16 ____ Complete the first column of the table. Fill in the blanks to complete the table. Symbol Z A #p #e- #n Charge Si 14 ____ ____ 14 14 ____ S2- ____ 32 ____ ____ ____ 2- Cu2+ ____ ____ ____ ____ 34 2+ ____ 15 ____ ____ 15 16 ____ Complete the second column of the table. Fill in the blanks to complete the table. Symbol Z A #p #e- #n Charge Si 14 ____ ____ 14 14 ____ S2- ____ 32 ____ ____ ____ 2- Cu2+ ____ ____ ____ ____ 34 2+ ____ 15 ____ ____ 15 16 ____ Complete the third column of the table. Fill in the blanks to complete the table. Symbol Z A #p #e- #n Charge Si 14 ____ ____ 14 14 ____ S2- ____ 32 ____ ____ ____ 2- Cu2+ ____ ____ ____ ____ 34 2+ ____ 15 ____ ____ 15 16 ____ Complete the fourth column of the table. Fill in the blanks to complete the table. Symbol Z A #p #e- #n Charge Si 14 ____ ____ 14 14 ____ S2- ____ 32 ____ ____ ____ 2- Cu2+ ____ ____ ____ ____ 34 2+ ____ 15 ____ ____ 15 16 ____ Complete the fifth column of the table. Fill in the blanks to complete the table. Symbol Z A #p #e- #n Charge Si 14 ____ ____ 14 14 ____ S2- ____ 32 ____ ____ ____ 2- Cu2+ ____ ____ ____ ____ 34 2+ ____ 15 ____ ____ 15 16 ____ Complete the sixth column of the table. Fill in the blanks to complete the table. Symbol Z A #p #e- #n Charge Si 14 ____ ____ 14 14 ____ S2- ____ 32 ____ ____ ____ 2- Cu2+ ____ ____ ____ ____ 34 2+ ____ 15 ____ ____ 15 16 ____ Complete the seventh column of the table. Complete the following table. Symbol Z A #p #e #n Charge _____ 8 ____ ____ ____ 8 2- Ca2+ 20 ____ ____ ____ 20 ____ Mg2+ ____ 25 ____ ____ 13 2+ N3- ____ 14 ____ 10 ____ ____ Complete the first column of the table. Complete the following table. Symbol Z A #p #e #n Charge _____ 8 ____ ____ ____ 8 2- Ca2+ 20 ____ ____ ____ 20 ____ Mg2+ ____ 25 ____ ____ 13 2+ N3- ____ 14 ____ 10 ____ ____ Complete the second column of the table. Complete the following table. Symbol Z A #p #e #n Charge _____ 8 ____ ____ ____ 8 2- Ca2+ 20 ____ ____ ____ 20 ____ Mg2+ ____ 25 ____ ____ 13 2+ N3- ____ 14 ____ 10 ____ ____ Complete the third column of the table. Complete the following table. Symbol Z A #p #e #n Charge _____ 8 ____ ____ ____ 8 2- Ca2+ 20 ____ ____ ____ 20 ____ Mg2+ ____ 25 ____ ____ 13 2+ N3- ____ 14 ____ 10 ____ ____ Complete the fourth column of the table. Complete the following table. Symbol Z A #p #e #n Charge _____ 8 ____ ____ ____ 8 2- Ca2+ 20 ____ ____ ____ 20 ____ Mg2+ ____ 25 ____ ____ 13 2+ N3- ____ 14 ____ 10 ____ ____ Complete the fifth column of the table. Complete the following table. Symbol Z A #p #e #n Charge _____ 8 ____ ____ ____ 8 2- Ca2+ 20 ____ ____ ____ 20 ____ Mg2+ ____ 25 ____ ____ 13 2+ N3- ____ 14 ____ 10 ____ ____ Complete the sixth column of the table. Complete the following table. Symbol Z A #p #e #n Charge _____ 8 ____ ____ ____ 8 2- Ca2+ 20 ____ ____ ____ 20 ____ Mg2+ ____ 25 ____ ____ 13 2+ N3- ____ 14 ____ 10 ____ ____ Complete the seventh column of the table. Fill in the blanks to complete the following table. Symbol Ion Formed Number of Electrons in Ion Number of Protons in Ion Ca Ca2+ _____ _____ _____ Be2+ 2 _____ Se _____ _____ 34 Mg _____ _____ 12 Complete the first column of the table. Fill in the blanks to complete the following table. Symbol Ion Formed Number of Electrons in Ion Number of Protons in Ion Ca Ca2+ _____ _____ _____ Be2+ 2 _____ Se _____ _____ 34 Mg _____ _____ 12 Complete the second column of the table. Fill in the blanks to complete the following table. Symbol Ion Formed Number of Electrons in Ion Number of Protons in Ion Ca Ca2+ _____ _____ _____ Be2+ 2 _____ Se _____ _____ 34 Mg _____ _____ 12 Complete the third column of the table. Fill in the blanks to complete the following table. Symbol Ion Formed Number of Electrons in Ion Number of Protons in Ion Ca Ca2+ _____ _____ _____ Be2+ 2 _____ Se _____ _____ 34 Mg _____ _____ 12 Complete the fourth column of the table. Fill in the blanks to complete the following table. Symbol Ion Formed Number of Electrons in Ion Number of Protons in Ion Cl _____ _____ 17 Te _____ 54 _____ Br Br- _____ _____ _____ Sr2+ _____ 38 Complete the fourth column of the table. Determine whether each of the following statements is true or false.Every atom of a given element has the same number of protons. Determine whether each of the following statements is true or false.The number of electrons in an atom equals the number of neutrons in the atom. Determine whether each of the following statements is true or false.The protons in the nucleus of the helium atom are held together by a force called the strong nuclear force. If an atom has 15 protons, how many electrons does it have? Iodine has a lower atomic weight than tellurium (126.90 for I, 127.60 for Te) even though it has a higher atomic number (53 for I, 52 for Te). Explain. In what part of the atom does the strong nuclear force operate? Define A, Z, and X in the following notation used to specify a nuclide: ZA X. The structure of the atom. A cloud of rapidly moving electrons occupies most of the volume of the atom. The nucleus occupies a tiny region at the center of the atom and is composed of the protons and neutrons. The nucleus contains virtually all the mass of the atom.What is the approximate diameter of the nucleus in units of pm? What basic properties of the electron were reported with its discovery? List the three subatomic particles that compose atoms. Give the basic properties (mass and charge) of the proton. Give the basic properties (mass and charge) of the neutron. Explain the difference between Z (the atomic number) and A (the mass number). Which of the following statements about subatomic particles are true?If an atom has an equal number of protons and electrons, it will be charge-neutral. Which of the following statements about subatomic particles are true?Electrons are attracted to protons. Which of the following statements about subatomic particles are true?Electrons are much lighter than neutrons. Which of the following statements about subatomic particles are true?Protons have twice the mass of neutrons. In complete sentences, describe the similarities and differences between:a neutral atom and an ion of the same element. To how many significant figures would you need to express the mass of an oxygen-16 atom in amu to notice the change in mass that occurs when it gains an electron? A period at the end of sentence written with a graphite pencil has a diameter of 1.6 mm. If the period represented the nucleus, approximately how large is the diameter of the entire atom in units of m? Answer the following questions:What are the main subatomic particles that make up the atom? Answer the following questions:What is the charge, in units of the electronic charge, of proton? What is the difference between an atoms atomic number and its mass number? Answer the following questions:What is the charge, in units of the electronic charge, of neutron? What is the difference between an elements atomic number and its atomic mass? Determine whether each of the following statements is true or false.The nucleus has most of the mass and comprises most of the volume of an atom. Consider an atom of 10B.How many protons, neutrons, and electrons does this atom contain? How many protons, neutrons, and electrons are in the following atoms?243 Am. Fill in the gaps in the following table: Symbol Co3+ Protons 34 76 80 Neutrons 46 116 120 Electrons 36 78 Mass number 59 Net charge 2+ Complete the second row of the table. Fill in the gaps in the following table: Symbol Co3+ Protons 34 76 80 Neutrons 46 116 120 Electrons 36 78 Mass number 59 Net charge 2+ Complete the third row of the table. Fill in the gaps in the following table: Symbol Co3+ Protons 34 76 80 Neutrons 46 116 120 Electrons 36 78 Mass number 59 Net charge 2+ Complete the fifth row of the table. Fill in the gaps in the following table, assuming each column represents a neutral atom: Symbol 79Br Protons 25 82 Neutrons 30 64 Electrons 48 86 Mass no. 222 207 Complete the first row of the table. Fill in the gaps in the following table, assuming each column represents a neutral atom: Symbol 79Br Protons 25 82 Neutrons 30 64 Electrons 48 86 Mass no. 222 207 Complete the second row of the table. Fill in the gaps in the following table, assuming each column represents a neutral atom: Symbol 79Br Protons 25 82 Neutrons 30 64 Electrons 48 86 Mass no. 222 207 Complete the third row of the table. Fill in the gaps in the following table, assuming each column represents a neutral atom: Symbol 79Br Protons 25 82 Neutrons 30 64 Electrons 48 86 Mass no. 222 207 Complete the fourth row of the table. Suppose that atomic masses were based on the assignment of a mass of 12.000 g to 1 mol of carbon, rather than 1 mol of 12C.Find the atomic mass of oxygen. How many electrons does it take to the equal the mass of a proton? Fill in the gaps in the following table, assuming each column represents a neutral atom: Symbol 79Br Protons 25 82 Neutrons 30 64 Electrons 48 86 Mass no. 222 207 Complete the fifth row of the table. On a dry day, your body can accumulate static charge from walking across a carpet or from brushing your hair.If your body develops a charge of -14 C (microcoulombs), how many excess electrons has it acquired? A helium nucleus has two protons and two neutrons.How many electrons would it take to equal the mass of a helium nucleus? What is the Z-number and the number of protons, electrons, and neutrons for the element belowprotons __________Neutrons ________Electrons _________Z ___________ Identify the atom and write the appropriate atomic symbol (including the mass and atomic number) for an atom containing 45 protons, and 58 neutrons. Complete this table. Note that the atoms/ions are not necessarily neutral.Element: Se ? ?Mass number: 75 65 ?No of neutrons: ? 36 43No of protons: ? ? 36No of electrons: ? ? 36Charge: -2 +1 ? Which statements about subatomic particles are false?a. Protons and electrons have charges of the same magnitude but opposite sign. b. Protons have about the same mass as neutrons. c. Some atoms don't have any protons. d. Protons and neutrons have charges of the same magnitude but opposite signs. What is the symbol for an ion with 63 protons, 60 electrons, and 88 neutrons? If an ion contains 50 protons, 68 neutrons, and 48 electrons, what is its symbol? What is the symbol of an ion with 16 protons, 18 neutrons, and 18 electrons? What is the symbol for an ion that has 16 protons, 16 neutrons, and 18 electrons? a. Specify the number of protons, neutrons, and electrons in the neutral atom bromine-80. Enter your answers as integers separated by commas.b. The ion O-2 has ___ protons and ___ electrons. Enter your answers as integers separated by a comma.c. What isotope has 13 protons and 14 neutrons? Enter the name of the element followed by a hyphen and the mass number (e.g., uranium-234).d. Which element does represent in the following expression: 41/20 X? Enter the chemical symbol of the element. Which of the following statements about subatomic particles is TRUE?A) A neutral atom contains the same number of protons and electrons.B) Protons have about the same mass as electrons.C) Electrons make up most of the mass of an atom.D) Protons and neutrons have opposite, but equal in magnitude, charges.E) Neutrons and electrons are found in the nucleus of an atom. Fill in the gaps in the following table:SymbolCo3+Protons347680Neutrons46116120Electrons3678Mass number59Net charge2+Complete the fourth row of the table. The ion O 2− has _____ protons and _____ electrons. Which statement is true? (A) The nucleus of an atom contains neutrons and electrons. (B) The atomic number of an element is the number of protons in one atom. (C) The mass number of an atom is the number of protons in the nucleus plus the number of electrons outside. (D) The number of electrons outside the nucleus is the same as the number of the neutrons in the nucleus. The species O 2-, F -, N 3- and Na+ are all a) anions. b) cations. c) isotopes. d) isoelectronic. e) halogens. A proton weighs 1.007276 amu, a neutron weighs 1.008665 amu, and an electron weighs 5.486 × 10−4 amu. What is the expected mass of a beryllium-9 nucleus, based on the total mass of its protons and neutrons? Express your answer in atomic mass units using seven significant figures. The number of protons in an atom determines the identity of the atom. What does the number and arrangement of the electrons in an atom determine? What does the number of neutrons in an atom determine? Determine the number of electrons, protons, and neutrons in the following chemical symbol. Specify the number of protons, neutrons, and electrons in the neutral atom iron-56. Enter your answers as integers separated by commas. The ion N3- has ___________ protons and _____________ electrons?Enter the chemical symbol of the element. The mass number is equal to A) the sum of the number of the neutrons and electrons. B) the sum of the number of the electrons and protons. C) the sum of the number of protons and neutrons. D) the sum of the number of protons, neutrons, and electrons. An iron-56 nucleus contains A) 56 protons and 56 neutrons. B) 26 protons and 30 neutrons. C) 56 protons and 26 neutrons. D) 30 protons and 26 neutrons. E) 26 protons and 26 neutrons. Determine whether the following statement is true or false. If false, correct the statement to make it true: (c) The number of electrons in an atom equals the number of neutrons in the atom. Determine whether the following statement is true or false. If false, correct the statement to make it true: (d) The protons in the nucleus of the helium atom are held together by a force called the strong nuclear force. Part ASpecify the number of protons, neutrons, and electrons in the neutral atom copper-64.Enter your answers as integers separated by commas.Part BThe ion S2− has _____ protons and _____ electrons.Enter your answers as integers separated by a comma.Part CWhat isotope has 17 protons and 18 neutrons?Enter the name of the element followed by a hyphen and the mass number (e.g., uranium-234).Part DWhich element does X represent in the following expression: 5525X?Enter the chemical symbol of the element. While it is helpful to know that many ions have the same number of electrons as a noble gas, many elements, especially among the metals, form ions that do not have the same number of electrons as a noble gas.Use the periodic table shown below, to determine which of the following ions have the same number of electrons as a noble gas. Which of the following atoms and ions is (are) isoelectronic with S 2+: Si4+, Cl3+, Ar, As3+, Si, Al3+? Write the symbol of each atom using the format.a. Which of the following is a symbol representing the ion obtained by removing two electrons from 63Cu ? What is the symbol for the isotope of 63Cu that possesses 36 neutrons? Write the symbol of each atom using the format.b. Write the symbol of each atom using the format.c. An element’s most stable ion has a 2+ charge. If the ion of element X has a mass number of 230 and has 86 electrons,what is the identity of the element, and how many neutrons does it have? Complete the following table, including the mass number and the atomic number with the symbol for the isotope. 49. What is the symbol for an ion with 63 protons, 60 electrons, and 88 neutrons? If an ion contains 50 protons, 68 neutrons, and 48 electrons, what is its symbol? What is the identity of the element X in the following ions?X2+, a cation that has 36 electrons. Fill in the gaps in the following table:SymbolP3-Protons3549Neutrons4566118Electrons4676Mass number31Net charge1-3+Complete the first row of the table, giving the element symbol for the ions. Fill in the gaps in the following table:SymbolP3-Protons3549Neutrons4566118Electrons4676Mass number31Net charge1-3+Complete the second row of the table for the number of protons. Fill in the gaps in the following table:SymbolP3-Protons3549Neutrons4566118Electrons4676Mass number31Net charge1-3+Complete the third row of the table for the number of neutrons for P3-. Fill in the gaps in the following table:SymbolP3-Protons3549Neutrons4566118Electrons4676Mass number31Net charge1-3+Complete the fourth row of the table for the number of electrons. Fill in the gaps in the following table:SymbolP3-Protons3549Neutrons4566118Electrons4676Mass number31Net charge1-3+Complete the fifth row of the table for the mass number. Fill in the gaps in the following table:SymbolP3-Protons3549Neutrons4566118Electrons4676Mass number31Net charge1-3+Complete the sixth row of the table for the ion charge. Fill in the blanks to complete the following table.SymbolIon FormedNumber of Electrons in IonNumber of Protons in IonCl__________17Te_____54_____BrBr–_______________Sr2+_____38Complete the first column of the table. Fill in the blanks to complete the following table.SymbolIon FormedNumber of Electrons in IonNumber of Protons in IonCl__________17Te_____54_____BrBr–_______________Sr2+_____38Complete the second column of the table. Fill in the blanks to complete the following table.SymbolIon FormedNumber of Electrons in IonNumber of Protons in IonCl__________17Te_____54_____BrBr–_______________Sr2+_____38Complete the third column of the table. Determine whether each of the following statements is true or false. If false, correct the statement to make it true. (a) The nucleus has most of the mass and comprises most of the volume of an atom. (a) Define atomic number and mass number.Which of these can vary without changing the identity of the element? Even though several elements have only one naturally occurring isotope and all atomic nuclei have whole numbers of protons and neutrons, no atomic mass is a whole number. Use the data from Table 2.2 (shown below) to explain this fact. 2.22Determine whether each of the following statements is true or false. If false, correct the statement to make it true. (b) Every atom of a given element has the same number of protons. 2.22Determine whether each of the following statements is true or false. If false, correct the statement to make it true. (c) The number of electrons in an atom equals the number of neutrons in the atom. 2.22Determine whether each of the following statements is true or false. If false, correct the statement to make it true. (d) The protons in the nucleus of the helium atom are held together by a force called the strong nuclear force. Which of the following statements about subatomic particles are true, and which are false?a. Protons and electrons have charges of the same magnitude but opposite signs.b. Protons have about the same mass as neutrons.c. Some atoms don’t have any protons.d. Protons and neutrons have charges of the same magnitude but opposite signs. Which of the following statements is/are true? For the false statements, correct them.a. All particles in the nucleus of an atom are charged.b. 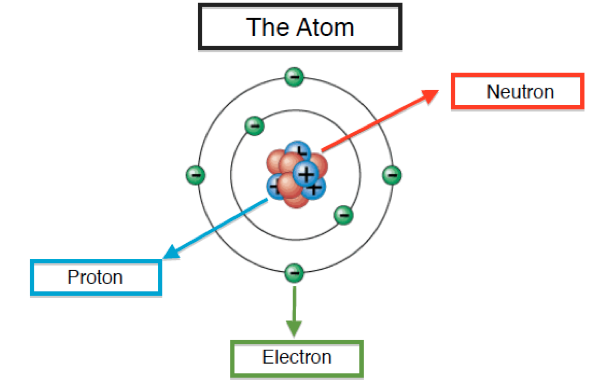 The atom is best described as a uniform sphere of matter in which electrons are embedded.c. The mass of the nucleus is only a very small fraction of the mass of the entire atom.d. The volume of the nucleus is only a very small fraction of the total volume of the atom.e. The number of neutrons in a neutral atom must equal the number of electrons. Does a cation gain protons to form a positive charge or does it lose electrons? Answer the following questions:Among the main subatomic particles that make up the atom, which is the most massive? Consider an atom of 63Cu. How many protons, neutrons, and electrons does this atom contain? What number of protons and neutrons is contained in the nucleus of each of the following atoms? Assuming each atom is uncharged, what number of electrons is present?a. What number of protons and neutrons is contained in the nucleus of each of the following atoms? Assuming each atom is uncharged, what number of electrons is present?b. What number of protons and neutrons is contained in the nucleus of each of the following atoms? Assuming each atom is uncharged, what number of electrons is present?c. What number of protons and neutrons is contained in the nucleus of each of the following atoms? Assuming each atom is uncharged, what number of electrons is present?d. What number of protons and neutrons is contained in the nucleus of each of the following atoms? Assuming each atom is uncharged, what number of electrons is present?e. What number of protons and neutrons is contained in the nucleus of each of the following atoms? Assuming each atom is uncharged, what number of electrons is present?f. How many protons, neutrons, and electrons are in each of the following atoms or ions?a. How many protons, neutrons, and electrons are in each of the following atoms or ions?b. How many protons, neutrons, and electrons are in each of the following atoms or ions?c. How many protons, neutrons, and electrons are in each of the following atoms or ions?d. How many protons, neutrons, and electrons are in each of the following atoms or ions?e. How many protons, neutrons, and electrons are in each of the following atoms or ions?f. How many protons, neutrons, and electrons are in each of the following atoms or ions?g. How many protons, neutrons, and electrons are in each of the following atoms or ions?h. How many protons, neutrons, and electrons are in each of the following atoms or ions?i. Uranium-235 is used in nuclear fission.Determine the number of protons and the number of neutrons in uranium-235. How many protons and neutrons are present in an atom of 1939K? Four Fe2+ ions are key components of hemoglobin, the protein that transports oxygen in the blood. Assuming that these ions are 53Fe2+, how many protons and neutrons are present in each nucleus, and how many electrons are present in each ion? Exercise 21.1 Write the following isotopes in hyphenated form (e.g., “carbon-14”)(a) 2411 Na(b) 2913 Al(c) 7336 Kr(d) 19477 IrFor each of the isotopes in Exercise 21.1, determine the numbers of protons, neutrons, and electrons in a neutral atom of the isotope. Identify each of the following elements. Give the number of protons and neutrons in each nucleus.a. Identify each of the following elements. Give the number of protons and neutrons in each nucleus.b. Identify each of the following elements. Give the number of protons and neutrons in each nucleus.c. Identify each of the following elements. Give the number of protons and neutrons in each nucleus.d. The atomic number of oxygen is 8. What is the mass number of a oxygen atom with 7 neutrons? How many protons are in an ion with 86 electrons and a -1 charge? How many total electrons are in a Cu2+ ion? Some ions do not have a corresponding neutral atom that has the same electron configuration.For each of the following ions, identify the neutral atom that has the same number of electrons: CI-, Sc3+, Fe2+, Zn2+, Sn4+. How many protons are in an ion with 10 electrons and a -1 charge? How many total electrons are in a Sr2+ ion? Complete this table. Note that the atoms/ions are not necessarily neutral. How many protons, neutrons, and electrons are there in each of the following atoms? Fill in the missing information in the following table of four neutral atoms. What is the charge on a hypothetical ion with 35 protons and 38 electrons? How many protons, neutrons, and electrons are there in a neutral atom of 55Fe (iron-55)? An ion has 20 protons, 18 electrons, and a mass number of 41. Part 1 How many neutrons does this ion have? Part 2What is the symbol for this ion? Enter both the mass and the atomic number. Determine the number of protons and electrons in each of the following. N3- Enter your answers numerically separated by a comma. Ga3+ Enter your answers numerically separated by a comma. Li+ Enter your answers numerically separated by a comma. An ion has 14 neutrons, 10 electrons, and a mass number of 27. Part 1How many protons does this ion have? Part 2What is the symbol for this ion? Enter both the mass and the atomic number. Write the chemical symbols for three different atoms or atomic cations with 26 electrons. Write the symbol for 12648X. Express your answer as a chemical symbol. Be sure to answer all parts.Part 1 of 2Do both members of the following pairs have the same number of protons? Neutrons? Electrons? 14C6 and 15N7 (i) Protons are equal. (ii) Protons are NOT equal. (iii) Neutrons are equal. (iv) Neutrons are NOT equal. (v) Electrons are equal. (vi) Electrons are NOT equal. Be sure to answer all parts.Part 1 of 2Do both members of the following pairs have the same number of protons? Neutrons? Electrons? 3H1 and 3He2 (i) Protons are equal. (ii) Protons are NOT equal. (iii) Neutrons are equal. (iv) Neutrons are NOT equal. (v) Electrons are equal. (vi) Electrons are NOT equal. Be sure to answer all parts.Part 1 of 2Do both members of the following pairs have the same number of protons? Neutrons? Electrons? 19F9 and 18F9 (i) Protons are equal. (ii) Protons are NOT equal. (iii) Neutrons are equal. (iv) Neutrons are NOT equal. (v) Electrons are equal. (vi) Electrons are NOT equal. Which atom and/or ion is (are) isoelectronic with Br +: Se2+, Se, As–, Kr, Ga3+, Cl–? How many protons are found in 131I, used in thyroid therapy? How many neutrons are found in 131I, used in thyroid therapy? How many protons are found in 60Co, used in cancer therapy? Write the chemical symbols for three different atoms or atomic cations with 3 electrons. Be sure to answer all parts.One isotope of a metallic element has the mass number 65 and 35 neutrons in the nucleus. The cation derived from the isotope has 28 electrons. What is the atomic number? Write the atomic symbol for this element. What is the charge of this species? Determine the charge of each of the following ions. Part Atungsten ion with 68 electrons Enter a signed integer. For example, +2 or -1. Part Btellurium ion with 54 electrons Enter a signed integer. For example, +2 or -1.